This is the second part in a series about making gardens accessible. Here is the first post. Make sure that water is available close to the garden and in a paved area so the ground does not get muddy. Use hand levers instead of round spigot handles and use snap connectors. This will lessen strain on hands and wrists. Select plants with contrasting or bright colors. Many plants naturally contrast ripening fruit against their foliage, making harvesting much easier. Also, look for plants listed as “compact.” Compact plants are typically more suitable for container growing because they are smaller and will be easier to reach. When creating a gardening area, make provisions for calling for assistance in case of an emergency, such as having a cellular phone or personal summoning device (available from commercial suppliers). To prevent accidents in the garden, select materials for garden path surfaces that will be firm, smooth, level, and provide traction. Wind chimes and audible water features, such as fountains and waterfalls, will help those with visual impairments orient themselves through the garden. Accessible gardening is growing in popularity, and websites addressing issues related to this topic are increasing daily. Each gardener has different needs and these should always be taken into consideration when adapting a gardening space. 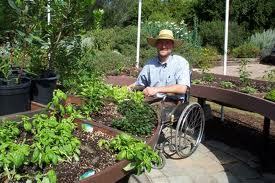 Do research before starting, and you’re sure to be pleased with your new, fully accessible garden. This information is adapted from the Wyoming AgrAbility 2011 Newspaper Insert and the University of Tennessee Cooperative Extension Service. Good information, Kelley. Thanks for summarizing this subject so clearly.